Maleny, a small Australian town that is using more of the techniques discussed in this book than perhaps anywhere else in the world, lies a thousand feet up in the Blackhall Mountains about fifty miles as the crow flies north of Brisbane. To get there, you turn west off the Bruce Highway at Landsborough and drive for eleven miles along a twisting road that climbs up from the coastal plain along a steep spur and, as it gets higher, provides superb views of the Sunshine Coast and Moreton Bay behind. Near the top, the carriageway narrows sharply as it skirts a cliff and there is an abrupt change in vegetation, the gum trees and coarse brown grass of the plain being replaced by rolling green hills and remnants of tropical forest. A little further on, the road turns down just before Bald Knob Lookout and runs past four or five guest houses and restaurants before entering the town. "When I came here in 1974, the road was narrower and even more winding as it followed the original wagon track built to take local butter to market" says Jan Tilden, who has a doctorate in sociology and works for The Range News, the local newspaper. The butter she refers to was produced in a co-operative creamery opened in 1904 by farmers who had moved into the area after the forests of cedar, southern beech and hoop and Bunya pines had been logged in the last quarter of the 19th Century. By early 1970s, however, most of the local farmers had ceased dairying and switched to beef in response to a steep decline in world butter and cheese prices during the 1960s. The switch meant that fewer farmworkers were needed and cottages fell vacant as they and their families moved away. In other cases, holdings were amalgamated, leaving farmhouses empty. Empty, that is, until the area was discovered by young, well-educated people from the cities looking for a simpler, less materialistic life. 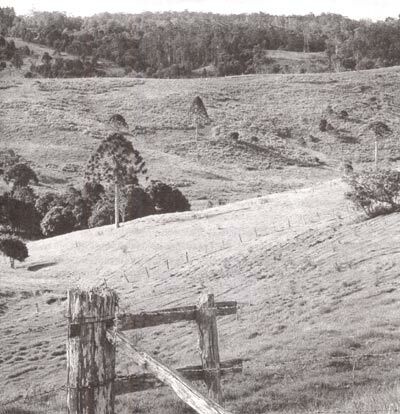 "I was one of the first of the new wave of settlers to move to the Maleny plateau" Tilden says. "The old share-farmers cottage I rented for $6 a week had no running water and unreliable electricity. The farmer who owned it was embarrassed to charge me anything at all." Jill Jordan, a psychologist who moved to Maleny three or four years before Tilden says that the local people did not know what to make of their new neighbours:. "We were looked on as hippies and treated with great suspicion" she says. Tilden agrees: "They were tolerant if not exactly welcoming. If nothing else, we citified newcomers were a source of good gossip." One source of complaint among the incomers was the poor range of foods available at the single local supermarket and early in 1979, at the suggestion of Lorna Wilson, who had arrived from the US where she had been a member of a food co-op, a meeting was held to discuss how this deficiency could be overcome. After considerable heart-searching - "None of us had any business experience" Jordan says - the idea of a co-op was accepted and a core group of three men and three women formed to establish it. "We wanted to eat lentils, brown rice and fresh vegetables, not the range of tired tinned produce then offered by the supermarket" Tilden explains. "At our first meeting paper was passed around and people wrote down what they ate and that became the basis for our stock list." The decision to meet the groups needs by establishing a co-operative rather than a conventional private business was important for what was to follow. So was the core groups brave decision that, rather than operating from someones home, they should rent a vacant shop on Malenys main street, Maple Street, so that the general public could trade there too and the venture could serve as a community information centre and meeting place. A small amount of capital was raised by selling shares, equipment and shopfittings were donated, and the business opened in January 1980 with Jordan as manager. Slowly, locals began bring in surplus produce to sell and after a year it was trading sufficiently well for her to draw a salary. "Some long-time residents came on the [co-op] board right away, happy to have a local outlet for their eggs and vegetables" Tilden says. "One of them, George Cassells, who was in his early sixties at the time, became financial manager. This helped bridge the gap between old and new Maleny residents." The co-op's success made the group associated with it feel that they could tackle other things and when Jordan returned from a Permaculture conference in Tasmania in 1983 with the idea of starting a credit union to recycle local savings, the level of enthusiasm was such that the Maleny and District Community Credit Union Ltd. opened on the opposite side of Maple Street only five months later under her management and received $53,000 in deposits on its first day. Three years later deposits topped a million dollars and by early 1998 it had 4,200 members and assets of $9m. Amongst other things, its loans had financed over thirty co-operatives and small businesses in the town and thus helped in the creation of around 200 part- and full-time jobs. Other beneficiaries had included people building houses in the internationally-known Crystal Waters Permaculture Village, half an hour's drive from Maleny, who would have found it difficult to get loans from any other source. By 1998, the credit union had enough resources to make house loans of up to $120,000, enough to buy a small plot of land and to erect a modest house. So big had the credit union become, in fact, that when we visited it in October 1997, several of the staff expressed worries that if it grew any more, its dealings with its members would become less personal. "We could become just like the bank I used to work for" a loan officer said. "We'd like to open a branch in an outlying town where the bank has closed but we probably won't because of that danger." "The credit union is the lifeblood of the community" Jordan says. "Many of the people who borrowed from it would have been unable to get loans from any other source. A proportion of its annual surplus is paid into funds for environmental and co-operative education. It also has a community development fund which the members decide how to allocate each year, and a community assistance fund, which can be distributed in times of hardship, such as a fire or an accident, to anyone in the community whether they are members or not." In 1987, news of Michael Linton's experiments with LET systems reached Maleny through the permaculture movement and Jordan paid her own fare to Canada to see how they worked. As a result, the first LETS in Australia opened in Maleny in October 1987. "It took off with a rush. People were ready for it" she says. Ten years later, the system had 1090 members trading in its unit the Bunya, which is named after a local pine tree from which the Aborigines collected edible nuts. There were also 22 other active LETS systems in Queensland, most of which had been helped to start up by people from Maleny. "LETS is not just an extremely powerful economic tool but a magnificent social one" Jordan says. "Older people often find themselves living alone on fixed incomes without the strength to undertake some tasks necessary for their dignity and survival. They feel useless, too, because, although they have built up a life-time of skills, they have no way of passing them on to younger people. LETS changes all that. It allows the elderly to earn credits by teaching their skills and then to employ energetic young people to get the physical work done." In 1988 and 1989, several more co-ops were established, including Wastebusters, which operates a recycling depot in collaboration with the local council, and Mountain Fare, which trains women with no work experience and which began by growing and marketing herbs and then moved into catering and frozen food production. All this activity encouraged the Queensland government to provide the capital to turn the old co-operative butter factory, which had closed in 1978, into an incubator unit for small businesses. This opened in 1991 with Jordan on the board and two years later, one firm established there had already outgrown it and moved into the outside world. Other businesses in the centre included a publisher and two food manufacturers, Pure Pasta Products, which uses organic grain, and Maleny Clean Cuisine which makes sauces and chutneys from organic ingredients. The centre's manager gives technical and moral support to the tenant businesses which share secretarial services. More recently, a telecottage has been established there to give tenants access to marketing and technical information. "Early in 1998 there were twenty-one co-ops and cooperative community organisations in the town including a community radio station and a licensed club which can serve as a cooperative training centre and meeting place by day and as a restaurant and venue for local musicians at night. It would be wrong to suggest that these co-ops transformed the declining town of the early 1970s into todays vital, vibrant community by themselves although they undoubtedly helped. Derek Sheppard, a former economic development officer with the Queensland government who resigned and moved to Maleny to escape 16-hour working days, suggests that an influx of retired people from the mid-1970s onwards played a much greater role in halting the towns economic decline. However, the growing number of what Sheppard calls superannualists has created problems for those seeking to build an alternative economy in the town. "The farmers are right-wing but they could work with the alternatives" Sheppard says. "The retirees are right-wing too but they wont accept attempts to find an alternative way. Its damn annoying. When we set up the club, the National Party fought the project every step of the way. And the folk festival, which is the biggest in Australia and brought $2m. into the town, has had to move to Woodford ten miles away. The retirees wont accept that there are other people in the community who have to make a living." So, although the co-operative movement in the town has become, according to Jordan, an incredible political force the growing right-wing element was powerful enough to deny her re-election to the council in March 1994 after she had served a three-year term. "I was unseated by the very forces that I originally went into Council to get rid of! Ugh!" she wrote to me shortly afterwards. "This shows how much there is to do in the local sphere in terms of education..."
This is certainly true. Catering for tourists provides a growing number of Maleny people with their incomes and the idea that the town should reduce rather than increase its dependence on the outside world is still unfamiliar to most residents. "Theres no widespread realisation even that its a good idea to shop locally" Sheppard says. "Were only a half-hour drive from the coast, where big shops offer a wide selection". And within the alternative sector itself, there is still much to be done. "The LETS system is only marginally useful" Sheppard comments. "It has had no real impact on the availability of necessities like groceries and foodstuffs. Builders and plumbers are also hard to get for Bunyas because they can get all the work they can handle for national currency." Jordan and other alternatives are trying to overcome these difficulties by getting as many people as possible involved in their various ventures. "Constant communication is the key to success" she says. "It is imperative to inform the broader community about every phase of a project so as to maximise their opportunities for involvement. Any organisation should have a broad base to ensure its stability. We ask people to become involved and stress that the proposals should enable everyone to make more income." # Start small, with the skills and resources available within the community. Better a small success than a grand failure. #. Draw on other people's experience. Have someone from your group spend time learning 'on the job' from a similar venture even if it means travelling to do so. #. Build up a system of mutual support within your organisation and, as you bring up more organisations, between organisations. This last principle is, in fact, crucial to what the co-ops have achieved. Any one venture, such as the food co-op, can only deliver limited results to the community as a whole no matter how big it becomes. However, once several organisations are operating, a synergy can develop between them with each contributing to the others' success so that the whole becomes greater than the sum of the parts and the range of possibilities open to people involved in them is radically transformed. "We really began to notice this from 1989 onwards particularly in relation to peoples skills. There are numerous stories of individuals who had never written a business letter or touched a calculator before coming into one of the Maleny co-ops who are now comfortable running their own micro- or mini-businesses or managing a multi-million dollar operation like the credit union. We have created an enterprise culture, a whole new sphere in which people can function." she says. Tilden agrees. "The last twenty years have been a time of rapid population growth and economic change in Maleny" she says. "The co-ops have prevented people feeling that they are powerless, that they have lost the plot. The enterprise culture here empowers people. As a result, when the Red Rooster [a fast food chain] opened, we were able to exert considerable influence over the way they operated and their employees conditions." But even given the synergy between them, the co-ops would not have survived and prospered without an appreciable input of unpaid, volunteer labour. "The need for voluntary input has characterised all Maleny co-ops to a greater or lesser extent, particularly in the early days" Tilden says. "For some years now, all workers have been paid at union-approved rates but co-op directors are still volunteers and members are encouraged to give service to keep prices at competitive levels. Some people question whether our co-ops can be considered viable businesses when they rely on volunteers but how is viability [to be] defined in a business struggling to be ecologically sustainable and socially just in an unsustainable and unjust global economy?" "Maleny is a town made up of communities" says Derek Sheppard who, with his wife Jo-anne, moved there because of the towns focus on arts and crafts. Now, besides being a director of the radio station co-op, Access FM, and the arts co-op, he is a driving force behind Maleny District Community Learning Centre Co-operative Society Ltd., which is setting up a school modelled on the Sudbury Valley School in the US for pupils between 4 and 19 - and adults outside school hours - at which everyone will decide each day what they wish to learn. "The depth and extent of the community in Maleny is quite wonderful. The commitment of people to ideals and their practical implementation together with the level of support which surrounds it all is exciting. It helps drive me on, even when the road becomes a bit bumpy" he wrote in the Autumn 1995 issue of the Maleny co-ops regular magazine, Review. "Maleny will tolerate variations in peoples behaviour and is remarkable for its support mechanisms" he told me. "If youve got a plan and you take it to the community, youll get support - mostly of the moral variety - to make it a reality." In short, Maleny is a town where people can learn, extend and fulfil themselves by involving themselves with each other. Who can ask more of their home-place than that? "Maleny is nowhere special" Jill Jordan says, "its just the product of a process that can be followed anywhere."